Pier Francesco Mola moved to Rome with his family in 1616. Little is known about his initial training but it is thought that he made two trips to the north of Italy, the first between 1633 and 1640 and the second between 1641 and 1647, with the intention of completing his studies as a painter. Mola was taught by Francesco Albani, and from a letter by that painter of 1658 we know that Mola was in his studio in Bologna for two years. 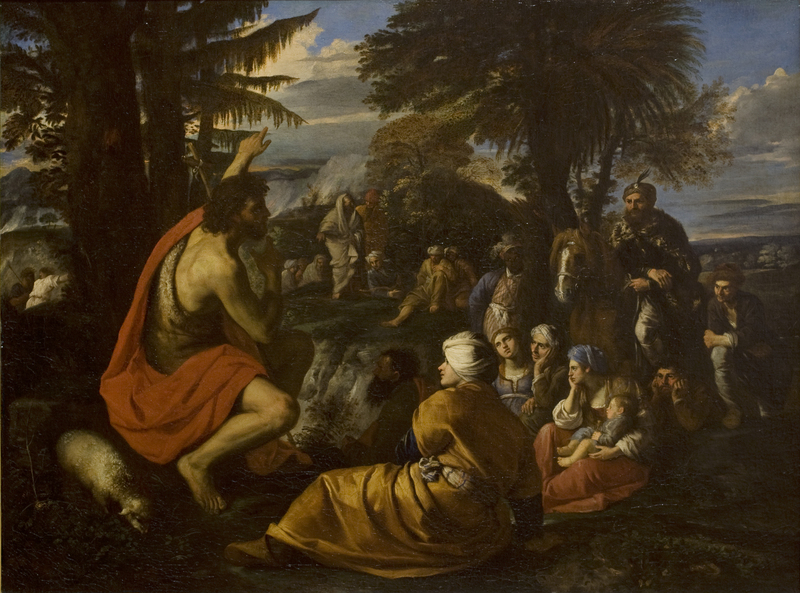 Albani is the source for the present painting of Saint John the Baptist preaching in the Desert. Mola’s time with Albani is recorded by Passeri in his biography of Mola, who noted that the period in question took place during Mola’s second trip to northern Italy. A fine draughtsman, Mola worked in fresco and easel painting, acquiring fame and renown from around the mid-century, at which date he began an important series of commissions to decorate illustrious villas and palaces. His compositions, use of colour and approach to the figure all reveal the influence of Venetian painting. This episode from the life of Saint John the Baptist, who can be recognised by his clothes and the lamb grazing peacefully next to him, is recounted in the Gospels. According to Saint Matthew, John preached in the desert of Judea, wearing a hair shirt tied at the waist with a leather belt. Crowds came to hear him from Jerusalem, Judea and the region around the Jordan, and John baptised them and heard their confessions. Mola converted the desert landscape into a green setting in which a crowd is seated at the foot of a mountain. The crowd surrounds the Baptist who holds his cane cross and points to the sky. With regard to its composition, the painting can be compared with a canvas by Francesco Albani of the 1640s that also depicts John the Baptist preaching in the desert (Musée des Beaux-Arts, Lyon). Albani locates the saint in an area of trees in the same corner as in the present canvas and surrounded by a listening crowd, both seated and standing. Mola, however, brings the figures much closer to the foreground planes, most notably that of Saint John. He also includes a rider whose equivalent place in Albani’s canvas is occupied by an old man leaning on a staff. Various preparatory drawings have been related to the present canvas, all including Saint John seated on the left among trees and talking to a crowd of figures arranged in a variety of poses. The most important among these drawings are the two in the Musée du Louvre and the one in the Staatliche Graphische Sammlung, Munich. Mola depicted this subject on other occasions, for example the painting in the National Gallery, London, which has less figures but includes that of Christ, and the one in the Louvre, in which Saint John points out Christ to a compact group of figures including a knight in armour.